You recently received a letter from Glenn announcing his retirement after 33 years as a coach and mentor. Without a plan to continue a track program on the west side, Glenn’s retirement would have meant the end of the Westside Track Club. Like many of you, we were grateful to Glenn for keeping the Westside club going, but disappointed to receive the news. We feel strongly that there needs to be a track club on the west side. The opportunities offered through the club are hard to find anywhere else nearby. We feel that the opportunity to train and compete in track events should continue. Rather than watch these opportunities disappear, we organized and devised a plan to continue a summer track program here on the west side. The plan going forward will be to continue to offer a summer track season, through an existing running club. 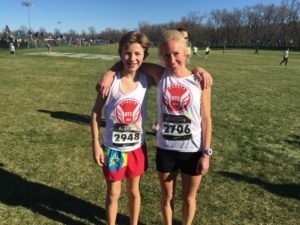 In fall of 2016, Scott Brinen, a parent and former track athlete started the Badger Track Club. The Badger Track Club currently offers cross country training for all ages, year round. Scott is excited about incorporating the Westside Track Club program into Badger Track Club’s summer season. Scott loves track and is eager to partner with us to offer track and field opportunities to children in the Madison area. He is very excited to take on the role of head coach and to continue what Glenn started with the Westside Track Club. We are excited there will be a summer track program. Please join us as we transition from the Westside Track Club to the Badger Track Club. The Summer Season through the Badger Track Club will run May 15-July 12. Practice days, times and location will be coming soon. The Memorial Track is being resurfaced this summer and so we will need a new location to hold practices. We will let you know as soon as we have more information. If you are interested in joining the Badger Track Club please email Jennifer Howlett, jrhfamilyof5@gmail.com, with your name, your child’s name, age & school and we will add you to the email list. We will email with club updates and a link to register when it becomes available. Again, we are very excited to be able to offer a summer track program and hope that you will join us for Badger Track Club’s Summer Season. 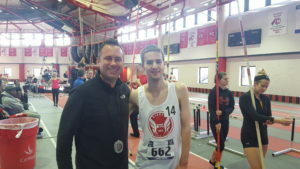 If you would like to learn more about Badger Track Club and Coach Scott Brinen please visit the club’s website, http://badgertrackclub.com/. We look forward to seeing you all this summer. Tyler Wigington won the 1,500M at the 2017 Wisconsin USATF indoor 1500M in a time of 4:48.83. He took the lead on the second lap of the race and never looked back. Tyler is currently training for the 2020 Paralympics in Tokyo. Keep checking back for the latest news on Tyler and his journey to 2020! When: Sunday, February 5, 2017 Packet Pick-up opens at 8:00 A.M. and continues throughout the day. See order of events for meet schedule. Track Meet must be done by 5:00 P.M.
Badger Track Club recommends core strength training to improve your fitness and distance running. Pascal currently works for Bowerman Track Club and is considered one of the best core strength coaches in the world of distance running. Pascal is a 3 time US Champion in the steeple chase, US Olympic Trials Champion and 2 time Olympian. He is a former Wisconsin Badger team-mate of Badger Track Club coach Scott Brinen. Badger Track Club incorporates techniques developed by Dobert to boost performance of it’s athletes. MADISON, Wis. – For the fifth consecutive season, the Badgers will be hosting the NCAA Great Lakes Regional meet at the Thomas Zimmer Championship Course. The Wisconsin men’s team is aiming for their 14th title since the turn of the century following a thrilling Big Ten crown, while the women’s team for a record 14th Great Lakes Regional victory. The women’s side will kick off the festivities with their six-kilometer race at noon (CT) while the men’s 10-kilometer race will follow at 1 p.m.
Make sure you come out to see this meet, it’s Collegiate Distance running at it’s best!!! Over the years the Wisconsin Invitational grew into the monster that it is today, only satiated when it devours numerous nationally-ranked teams. What started off as a modest proposal to bring 8-10 teams per gender, at most, for each championship race turned into what cross country fans will see on Friday afternoon. Fans not in attendance at the Thomas Zimmer Championship Cross Country Course can follow along with the action on the National Results Wall on USTFCCCA.org. On Saturday, November 6th, on the campus of University of Wisconsin-Parkside, Kenosha, the USATF Wisconsin Cross-Country Meet will be held. Entries are now being accepted, both online and mail-in. Those interested in competing must be 2016 USATF members or 2017 members (beginning November 1st). Individual memberships can be purchased at http://www.usatf.org/Products—Services/Individual-Memberships.aspx. Online entry for the Junior Olympics (ages 18 and under) is at http://www.athletic.net/CrossCountry/Results/Meet.aspx?Meet=123030#/Meet. Online entry for the Open and Masters divisions is at http://www.athletic.net/CrossCountry/Results/Meet.aspx?Meet=123039#/Results. ​Sports science, circa 2005, was pretty confident that ice baths accelerate recovery by fighting the inflammation in muscles after a hard workout. The actual evidence that ice baths really hastened recovery was admittedly ambiguous, but the idea that cold fights inflammation seemed self-evident.